There’s a story of discovery and research to this work, which was first found in 1930, championed by Hermann Scherchen, but not attributed with any certainty to the youthfully deceased Giovanni Battista Pergolesi, published just recently, and recorded only now. A cycle of seven small cantatas, quite unlike any other Seven Last Words (Schütz, Haydn, Franck, MacMillan…), Septem verba a Christo is an extraordinary work, lovingly championed by René Jacobs. The recitatives are alive and almost counter-intuitively nimble, typical for AkAMus’ brand of early music excitement. 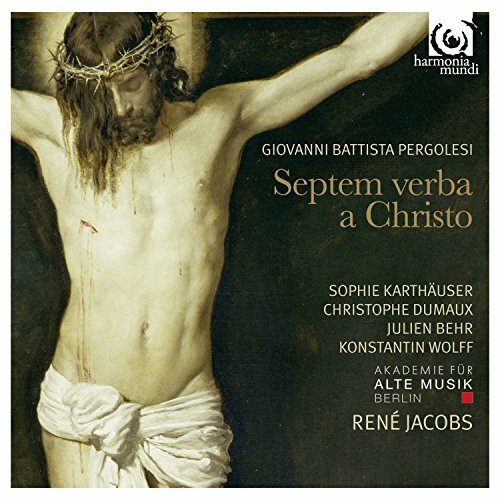 The arias—around bass/Jesus Konstantin Wolff—are splendidly done. The description that crops up again and again is “delicate”. There is a sophisticated delicacy to every aspect of this performance, as if the music—for all its vibrant outbursts—was made of the finest Belgian bobbin lace.